Medscom.com is one of the first online pharmacies offering branded and generic medicines. They started operation in 1999 putting a strong emphasis on the importance of privacy and confidentiality of their customer’s information. In addition to discreet delivery, they also do it for FREE. Medscom.com is located in Limassol, Cyprus. All drugs on their catalog are from India and are Indian FDA approved. These drugs also approved by the World Health Organization. Being in the business for the last 18 years, Medscom.com encourages their customers to send them an email in case they are looking for medicines that are not available in their online catalog. 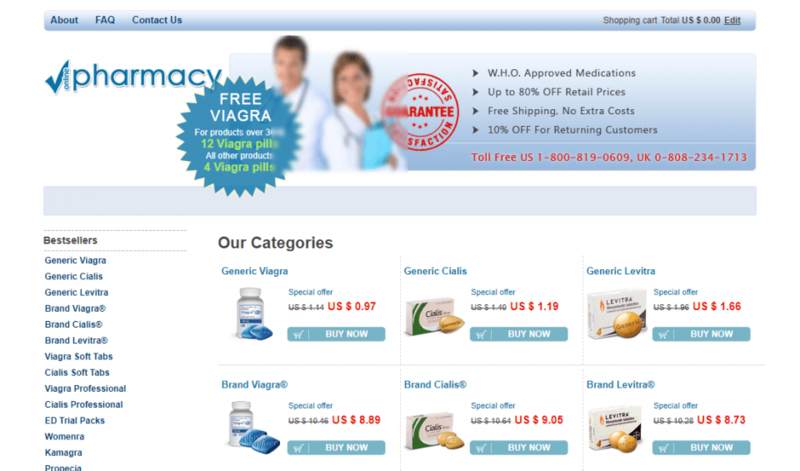 With a promise of free worldwide shipping, I started checking the available Viagra pills that Medscom.com offers. For their generic Viagra, the regular price is $1.14 per pill but a current promo put it at $0.97 per pill (as of the writing of this review). Branded Viagra on the other hand (Pfizer) is sold at $8.89 per pill from its regular price of $10.46. The price difference between their generic and branded offering is indeed huge. I decided to contact them to ask about the huge price difference of their branded and generic ED drug. Being in the business in the past 18 years, I am almost tempted to make a purchase from Medscom.com. Their website says that they offer secure SSL technology, ensuring that payment using a credit card is safe. Medscom.com only accepts credit card such as Mastercard, American Express, Visa, and JCB cards. They honor Echeck as well. Upon purchase, an email confirmation is being sent to customer’s listed email address. One of the reasons I checked Medscom.com is for their Free Worldwide Shipping offer. This offer is for regular airmail shipping and it takes 14 to 21 business days for the order to be delivered. For customers in Europe, orders can be delivered within 18 business days after order receipt. Customers who want fast shipping can opt to have Fast Shipping Service for $25 (delivery time depends on customer’s location but is faster than the usual 21 business days). If the order is shipped via postal service, the order can be tracked by customers. However, if it is via International Unregistered Airmail, the package is not available for tracking. I am almost certain that this website is reliable but before placing my order, I want an answer to my question about the huge difference in price of their generic and branded medicines. The most accessible option for me to contact them though is through their email at [email protected] I sent them my inquiry here. If you are a customer in the US, you can contact them at 1-800-819-0609. For UK customers, you can contact them at 0-808-234-1713. They don’t have a chat support service available at the moment. Almost everything about medscom.com seems believable. With 18 years of experience to back them up, medicines that are Indian FDA and World Health Organization approved and cheap generic medicines to offer, I almost prepared my credit card so I can make the order. Just one last thing that I want to check is the different reviews from their customers. After clicking here and there, I found no reviews of Medscom.com. As an online buyer, I rely on customer reviews 50% of the time. It is one of the important basis that I used whether I will trust a certain online shop or not. With no customer review to back them up, my hope in this website slowly went from 4 to 2. As a last resort, I went ahead and checked scamadviser.cm. According to scamadviser.com, Medscom.com is a website based in Germany but can be operating in Turkey. Scamadviser also shows that it is a “high-risk country”. Notes from scamadviser.com also show that Medscom.com had been listed as a ‘high-risk site” with low reliability. In addition to scamadviser.com, I also check the legitimacy of Medscom.com and found this. Apparently, Medscom.com had been listed as a “rogue site” meaning it is untrustworthy or dishonest. With this feedback, I have lost all interest in buying anything from Medscom.com. The free shipping promo is really an attention-grabber and it really caught my attention. This is true for all regular international shipping worldwide with a wait time of up to 21 days according to their website. In addition to this, if I end up buying $300 worth of Viagra products, I will be getting 12 more Viagra pills (and that really makes my hand sweaty). The only problem is, I cannot find any customers who can back up this claim or can testify that this is true! Still, if is this is real and I decides to purchase from them again in the future, I will be getting another 10% discount! It is indeed a big saving – if only I can verify it with genuine customers. According to Medscom.com, they have been operating since 1999 and yet after more than 18 years, I cannot find a single customer to testify about how great this online pharmacy is. In 18 years, they don’t even have a single review as well, even from fraudulent websites. This website also cites that they offer drugs that are Indian FDA and World Health Organization approved yet it is classified as a “rogue” website. With no concrete evidence to back up their claims, I am now hesitant to make any purchase from Medscom.com. Until I see some people talking genuinely about this website, the service, and products they had received, I will continue staying away from it. I rate this online store 3 out of 5.